I’d be lying if I said a near-death experience had been part of the plan all along. Lilly and I have often discussed, and often been asked, exactly what situation would be regarded as extreme enough for us to spend money. We’re both resolute: it would take a medical emergency of drastic proportions for us to part with a penny of cash. Life-on-the-line type stuff. My, how we joked. Mocking up occasions where one of us limps broken-legged ‘just a bit further’ whilst the other crafts a splint from tree branches. Laughing over the question of ‘how ill is really ill?’. Pondering what kit we would part with in order to make it easier to continue for the injured party. We never even considered an allergic reaction. It’s hard to admit, given the pride I put in trying to be confident and calm and collected in all situations, but this week I found myself terrified. My face swelled, my skin burned, my chest tightened…and tears rolled down my cheeks as a horrifying allergic reaction swept through me. 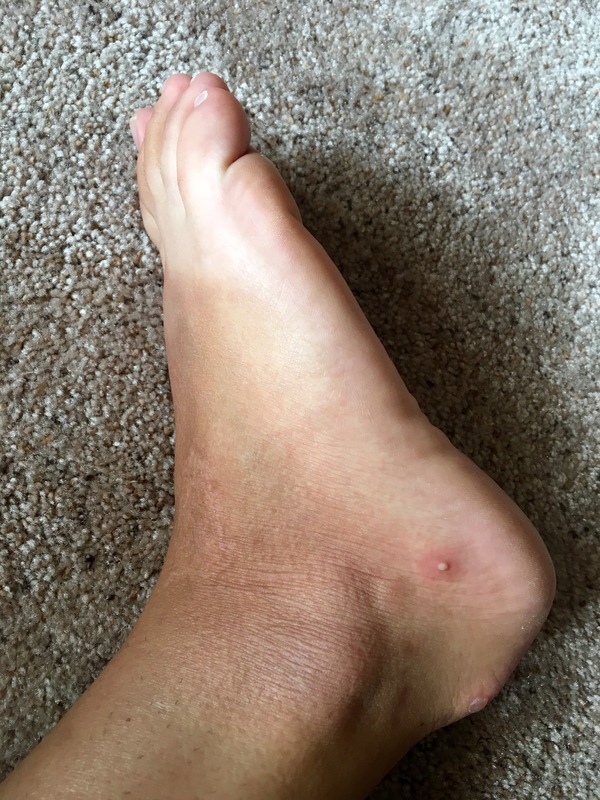 I had been bitten – just once – by a fire ant. Lilly and I were stood on the side of a road in Dallas, Texas: boiling hot, tired from a two mile walk with 50lb bags in the heat and humidity, frustrated by the well-meaning homeless people asking 5,000 questions, and trying to catch a ride to Waco. We were stressed. That stress was suddenly made ten times worse for Lilly, when she started swiping ants off her feet and running to stand on the curb with me, having been stood further back on the grass. “It burns! !” She cried, her usual ‘save every animal, big or small’ approach lost in her desperation to get rid of the biting, burning creatures. I watched her swipe her feet, concerned, until I felt a burning sensation building in my ears. What could I say? What bad timing! Here was Lilly, expressing the pain she felt in her feet and (rightfully) expecting me to feel sympathy for her, and all I wanted to do was say ‘OH MY GOD I DON’T CARE ACTUALLY BECAUSE MY EARS HAVE STARTED INEXPLICABLY BURNING!’ What a bad friend to ‘steal her thunder’ or belittle her pain but SERIOUSLY MY EARS ARE SO INCREDIBLY PAINFUL WHAT IS HAPPENING?! At this point I had no idea I had even been bitten. The fire-like pain that spreads from a fire ant bite had apparently been far out-gunned for me by the pain in my ears. I quickly suggested that we both take a Benadryl. Walking over to my bag felt like walking through fog. My legs felt heavy, I felt dizzy and everything was getting hotter. Was I really that stressed by the whole situation? Was I dehydrated? Why was my skin so itchy? I knew the Benadryl was buried deep in my rucksack but a voice in my head resisted my urge to not bother. By the time I had swallowed I noticed a rash spreading out from my armpits. When I made it back to Lilly to ask what she thought it could be she stared at me in disbelief – the same rash was spreading up my throat and over my face. My eyes started to swell. My scalp was burning. I had to sit down. Both Lilly and I have been raised to be extremely critical when it comes to assessing medical situations. We have extremely similar stories of appendicitis, where both of our mothers called the NHS advice number AND took us to the GP before resigning themselves to the fact it would probably warrant a trip to A&E. To call an ambulance you’d better be beheaded. Or worse. It was lucky, then, that the decision to go somewhere was taken out of our hands: at that exact moment, a man pulled over to take us to Waco. Lilly and I looked at each other and had the same thought: would it be stupid to just go to Waco right now? Does the tightness growing in my chest really need urgent attention? If anyone else was to ask me the same question I would say ‘YES, YOU IDIOT’ but when it comes to myself it’s harder to judge. We looked at each other, looked at the driver, and asked if he could take us to the ER. Arriving probably no more than 15 minutes later (‘thank you!’ we smiled at our bewildered driver as I, ever British, refused his offer of carrying my bag into the ER despite the fact I was finding it hard to see through swollen eyes or feel anything through burning skin) we stumbled into the queue at Dallas ER. I couldn’t stand up any more and slumped on the floor before a security guard told me to sit on a bench instead. Again, we showed our inability to accept this was a bad situation and waited dutifully in the queue to be checked in. When we reached the front – ‘what seems to be the problem?’ – and quietly explained what was happening, it was almost comical to see the realisation dawning on the receptionist’s faces. “I have an EpiPen here.” One stated faux-calmly as she flagged down a wheelchair. The other took my pulse and told the porter to take me directly through the doors. Minutes later I was on a bed with an IV in my arm, Benadryl, steroids and some other medication I didn’t catch the name of being injected by the bag-load whilst two different doctors and four different nurses came in and out to ask the same questions. I felt drunk and dizzy and disorientated, asking Lilly to snapchat the whole thing almost to prove it was actually happening. Slightly to deflect from the fact I was completely terrified. Looking back on that video, I can even convince myself that I’m pretty chilled about it all. Once fully medicated, the nurse at my bedside congratulated us on our quick thinking to take Benadryl as soon as the reaction began. “It may have saved your life” she stated, as blasé as if making a comment on the weather. “If it happens again, the reaction will be faster and more severe”. So matter-of-fact. After that it all calmed down. I was safe, it was funny, we were sitting in a hospital room watching ‘Taken’ on the telly and a machine softly bleeped my much slower heat rate next to me. The hives started to fade, the belt around my chest released its grip and the burning subsided. I could see clearly again. What a ridiculous, unexpected, overly-dramatic turn of events. Our attention turned to the challenge. If we had to spend money to leave the hospital…had we failed?? A weird sense of guilt flooded through me and I wondered again if we could’ve waited it out on the side of the road. (“It’s just a flesh wound!” Says the Black Knight). Luckily, we both have travel insurance that covers emergency care AND hitch hiking. So my ER visit will either be covered, or payment postponed until I get home from my travels. The prescriptions, on the other hand… Do I really need an EpiPen to take on the rest of my journey? We looked at the map of where fire ants are found to see if I can get away with just avoiding those areas. No such luck. Almost every state we have left appears on the list and ants aren’t easy to avoid when you’re camping and hitching. The threat of my reaction being worse next time weighed heavy on our minds as we decided what to do. What do you reckon: challenge failed, or wise decision made?! OMG, good decision making. I’m so glad your okay. Love you lots! Don’t you fear for your safety when you are hitching rides? You’re a lot braver than I am.